One of the most satisfying parts of travel is discovering the best local secrets for where to find great food. 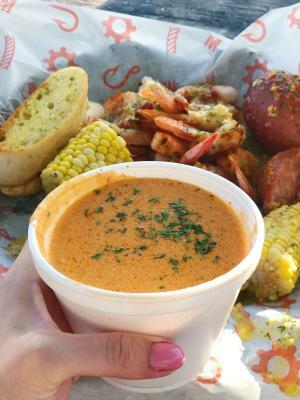 Florida’s Space Coast is full of great foodie finds, and that’s no doubt what you’ll get at an authentic Florida spot like Melbourne Seafood Station: a casual, low-country-boil seafood joint. Here the catches are fresh, the flavors are big, and the service is fast. If you’re anything like us, you like finding places to eat that really capture the essence of the city you’re exploring. Melbourne Seafood Station perfectly reflects Melbourne’s laid-back, coastal vibe. The original location sits on historic Highway U.S. 1, just off the Melbourne Causeway. The Melbourne Seafood Station owners transformed a former gas station into a charmingly casual eatery. There’s a quick-order counter inside, with all seating located outdoors on covered picnic tables. It also boasts one of Downtown Melbourne’s signature murals on a side exterior wall of a boldly colored underwater scene. The space tastefully retains the bones of its original gas station structure, as a nod to its current status as a quick, “fill-up station” for seafood lovers. On each picnic table outside, you’ll find an industrial-sized roll of paper towels – you’ll understand why once you see your order arrive. Owners Nick Moon, Naomi Moon, and Ryan Kelley began Seafood Station with the commitment to source fresh, quality seafood served up in a quick and casual style. There’s always a large variety of shrimp, crab, lobster, cod, grouper, hogfish, salmon, mussels, scallops, clams, and more. 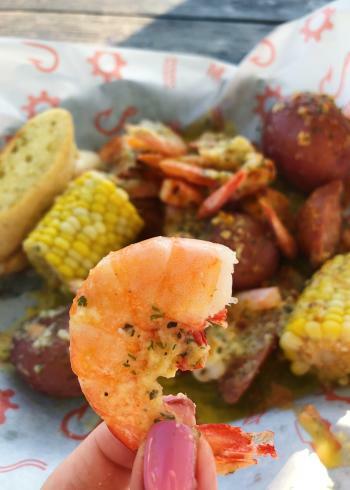 Not only are the catches fresh, but their other staple side-items like garlic toast, corn, and sausage are always lavishly prepared with the best seasonings to give it that authentic low-country boil flavor. Melbourne Seafood Station offers a straightforward menu with plenty of options for seafood lovers, with three main entrée styles to choose from: Signature Boil Baskets, Build-A-Bowl, or Family Feasts. The Signature Boil Baskets make it easy to get a variety of fish and flavors all in one large serving. Each basket comes with a hearty helping of the meat of your choice (assorted varieties of lobster, crab, shrimp, and shellfish), plus sausage, corn, potatoes, and garlic toast all in a buttery, perfectly seasoned basket. With the Build-A-Bowl option, you can get a little more custom. First choose your base of rice, linguini, grits, or broccoli, then add your choice of seafood, and finish off with your seasoning preference. All of these bowls are served with corn and garlic toast, with several sides and add-ons available for those wanting an even bigger portion. The variety here also allows flexibility for those with food allergies. The Family Feasts section allows larger groups to enjoy a more economic family-style assortment of fresh catches of their choice, with plenty of the signature sides of garlic toast, corn, sausage, and potatoes included as well. In short, no one leaves this place hungry. Generous portions and plenty of included sides make this a popular spot for those wanting a hearty and fresh meal, fast. A tried and true favorite for us, we knew ahead of time about the large portion sizes and opted to split the Chef’s Shrimp Trio basket from the Signature Boil Baskets section. We love this one because it comes with boiled red, white, and pink shrimp that are large, easy to peel, and the flavor never disappoints. If the shrimp weren’t satisfying enough, the meal included garlic toast, corn, potatoes and sausage, indulgently buttered and seasoned with mouth-watering Cajun flair. We also tried the lobster bisque on the side. Dipping thick pieces of garlic toast in this was amazing! And true to the owners’ original vision upon opening their restaurant, the service was fast with our order ready in a matter of minutes. When it comes to devouring these blissfully buttery seafood baskets, the paper towels on the table will be your best friend. We recommend fashioning a make-shift bib for your shirt as well as extra for your lap, and keep plenty flowing for your hands! With all the peeling of the seafood and the corn on the cob, your fingers WILL get messy. But once you’re knee-deep in all that fresh seafood goodness, we don’t think you’ll mind. It’s all part of the authentic low-country seafood experience that so many have come to love at the Melbourne Seafood Station. A perfect post beach stop with its location right along the waterway, you can’t miss this memorable spot when dining in Melbourne!